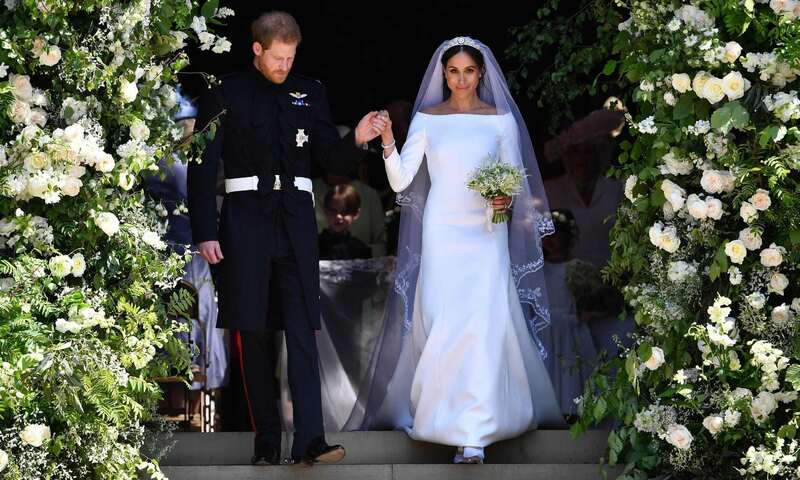 / Why Harry and Meghan’s ceremony exceeded all expectations, and more! I did not see that coming. Any of it. I honestly thought that when I finally sat down to watch the wedding (I had my own wedding on May 19th) that I would simply be sitting down to watch a replica of Kate and William’s wedding ceremony seven years before. I really thought that it would be a scaled down version of their wedding, just a different venue, different dress, but oh how I was proved wrong and surprisingly so. Whilst I was full of excitement to see this lovely modern couple making their love official, I did not bank on being blown away by all the personal touches that had been weaved in to the ceremony. In fact, like with Kate and William’s, I didn’t think there’d be any personal touches at all. So I’m going to work my way down through the course of the ceremony and breakdown all of the elements which had me glued to my seat, and there was a lot of them! I’m not going to spend too much time talking about Meghan’s dress, as that’s not what I’m here for and also because there really is nothing else to add that the media hasn’t already covered. She looked AMAZING. Full stop. Regal, classic, sophisticated, understated, natural and beautiful. Well done to Claire Waight Keller from Givenchy. The end. Meghan’s family dramas (everyone has some sort of wedding drama!) had her final arrangements all over the place but in the end they took decisive action and had a good solution which obviously pleased all the people who needed to be appeased. I would have loved to have seen Meghan perhaps walked all the way by herself. Whilst it was a nice gesture that Prince Charles did it, I didn’t feel to me like it added anything to the proceedings, yet nor did it take anything away from it. I would have loved to have been party to these conversations to know whether Meghan having her mum walk her down the aisle, was ever a suggestion or an idea. Whether it was poo-poohed, vetoed, squashed or never even a consideration. I’ll just have to wonder instead. I think though that the Queen probably made it clear that Meghan would be have to be accompanied at some point but some figure of a man, and for that there would be no negotiation. But let’s talk about that beautiful solo part of the walk. Poised, elegant, strong, independent and symbolic on all levels. Loved it. I also loved seeing Harry’s little rosy red face at the end of the aisle. You could see flashes of the little boy in him, excitedly waiting for the best thing to happen to him, to keep on happening to him. I don’t care about what anyone says about Bishop Curry’s address, because I loved it. He was passionate, he was engaging, and made Justin Welby, the Archbishop of Canterbury and the other one, whose name I won’t bother to look up, seem like they were half asleep. Honestly, if they didn’t have him to break up their roles, it would have been a very dry part of the ceremony. He bought life, zest, colour (literally) and energy to the proceedings and connected with people on a real, human level, which I think clergy at other royal weddings have never done before. Yes, they’ve spoken eloquently, yes they’ve said nice things but have they really ever touched people’s core in the same way? Or caused others to have such a strong reaction, and to think of the words said, long after they were said? I don’t think so. ‘Love is the way,’ is going to be an oft-used, well-known expression for a long time to come. Anyway, I don’t want this to become a comparison of one one clergy over another (although it might be too late for that!) and I do understand that Justin Welby and he whose name I don’t know, had a different role to play on the day, but I definitely wanted to give a shout-out for all that Bishop Curry brought to the wedding. For the awe he created. The smiles and laughter he raised and the genuine look of shock and bemusement on the faces of those who did not know what to do with all of that energy, other than sup it up. That was priceless. To be able to expertly sew Martin Luther King, slavery and social media into a wedding address and make it poignant and poetic, takes some skill. You’ve got to hand it to the man for shaking up those cobwebs of St George’s chapel. So there was no change or surprise with the vows here, sadly. I was really really really hoping that they would have been able to say something more personal to each other, other than the formal, traditional words they had to repeat, but that was perhaps a too big an ask! However, what was lovely and maybe this is both Meghan and Harry’s feminism creeping in here, is that she did not promise to obey her husband. Yes! Thanking you kindly Harry and Meghan. We really don’t need anyone to say those words ever again, unless they’re a child who needs to listen to what their parents are telling them. Another great thing is that Harry broke with royal tradition and also wore a ring. Unlike his brother, Harry made the decision to be a bling-wearer along with his wife, which is a wonderful nod to the ideals of equality which seem to be pertinent in Harry and Meghan’s vision for their relationship and for the world at large. Of course, I had always expected that there would be choir boys (singing beautifully as always) and the string orchestra and singer (beautiful as always) but can we just take a moment to revel in the wonder of the awesome Kingdom Choir. Oh my goodness, what an unexpected delight. From their carefully choreographed outfits in shades of white, pink and lilac to their stunning rendition of Stand By Me. I’ve already re-watched this part a few times, I’m saying a few because I can’t actually remember how many times I have watched it but I’m certain its more than a few. And then at the end of the ceremony, when Harry and Meghan were outside on the steps, greeting the crowds and giving them the kiss that they wanted to see, it was so lovely to hear ‘This little light of mine,’ a rousing, black American church song and civil rights anthem being bellowed out around the chapel, what an amazingly uplighting way to finishing off a ceremony, which had already delighted and surprised so many. And of course, I cannot touch on music without mentioning the outstanding cellist Sheku Kanneh-Mason, who at just 19 years old, played to the chapel dwellers with so much confidence and passion, it’s no wonder he was crowned BBC Young Musician of the Year a few years ago. Outstanding. I bet his agent’s phone is ringing off the hook, as it that of the choir! Good for them! With my Celebrant’s hat on, I just want to make a couple of points. Firstly, the one thing that I felt that this ceremony lacked was that of applause. I just don’t get it. The one emotional bind that brings people together and creates an atmosphere of joy and happiness, was severely lacking. This was one tradition, custom, rule, whatever you want to call it, which really could have been forsaken. After Bishop Curry’s address, people should have been on their feet applauding. The man spoke truth, and depth and love, yet finished to silence. Yes, I know it’s not a concert and yes, I know it’s not about him, but that would have been the most natural, normal reaction to have. But it was stifled in favour of reverence, piety and an ‘this-isn’t-what-we-do’ attitude. If he was in his own church, people would have gone nuts with applause. When the gospel choir finished their first amazing rendition, people should have been clapping and showing their appreciation for their touching, soulful performance. But nothing, just silent appreciation. When Sheku Kanneh-Mason finished his cello pieces, nothing, silence. When the readers read their texts, nothing but silence. Did the ceremony have to be so conservative that people could not put their hands together and offer some heartfelt gratitude and love through applause? It felt so strange to me. So alien. My one criticism, really. I’m also really glad Harry and Meghan felt relaxed enough to hold hands as I thought there was going to be a repeat of Kate and William, who if memory serves me well, did not touch each other until they walked back up the aisle once married, apart from when William placed the ring on to Kate’s finger. I know it’s a bit different because they’re likely to be future King and Queen, but come on, you can be royal and be a human being. And lastly, this shouldn’t even be a sidenote, but let’s just spend a moment talking about Doria Ragland, Meghan’s mother, who epitomised sheer grace, dignity and sophistication in the face of some turbulent family dramas, yet on the day was the picture of pure love. You could see at some points during the ceremony that she was so overwhelmed, not just with love for her daughter and new son-in-law but with being transported into a world so foreign, so different, so unimaginable, yet she did it all alone, with no-one by her side, no-one’s hand to hold and squeeze and convey a mutual sense of awe with. Incredible. Just incredible. This wedding was so much more than I expected it to be. And although at the crux of the day, this wedding was about two incredible individuals, finding love and celebrating that love in front of their friends and families and perhaps a few people they kind of had to invite, it was also so much more than that. It was a sign of how the monarchy has changed and how that change can have an impact (even if it’s just a small one) on the racial and cultural divisions and fractures in the UK and beyond. I watched the wedding with my mum, a British, Commonwealth West Indian, who moved to the UK aged eleven, as part of the Windrush generation. The former inhabitant of an island which was colonised by Britain, until its independence in the 70s. Where reverence and respect for the monarchy was instilled and expected from a young age and where you were taught to love and embrace Great Britain, even though many of its inhabitants were not quite ready to love and embrace you. The monarchy that one was expected to respect and revere always seemed like a monarchy which was so far removed from the common man and woman, and even more so from the common ethnic minority man and woman. Even for me growing up, British born and bred, and proudly so, I never felt aligned with the royal family. Not until Diana became prominent and showed the world that there was a human side to them, because after all, titles, lineage, and history aside, they are still human beings who breathe the same air and bleed the same blood. So this wedding for us, for me and my mum, the rest of our family and other ethnic minorities like us, was a big deal. To see a woman of colour being accepted and welcomed into one of the most prestigious and historic families in the world. For so many children of colour in the UK, to benefit from seeing more positive women of colour as role models (the list is growing, it really is). For them to grow up being able to see themselves and people who look like them being represented in mainstream media, politics, the wedding industry, the Royal family! It’s getting better, it really is. We had tears in our eye witnessing a day that neither one of us thought would ever happen in our lifetime, and seeing black culture not just being included into official royal proceedings but being celebrated and lauded too.